The second season of Hannah Montana aired on Disney Channel from April 23, 2007 to October 12, 2008. During this season Miley and Lilly fight more, Oliver gets an alibi to hang out with Hannah Montana and Miley grows closer to Oliver. The second season premiered with five new episodes in one week from April 23–27, 2007. "(We're So Sorry) Uncle Earl" aired in a week-long Disney Channel event called "Sweet Niblets, We're Related?". Disney Channel UK premiered five new Hannah Montana episodes for "Montana May", "(We're So Sorry) Uncle Earl", "You Didn't Say It Was Your Birthday", "Joannie B. Goode", "The Test of My Love", and "Yet Another Side of Me". The second series premiered in June 2007 on Disney Channel UK; it then aired on free-to-view Channel Five just like season one in October 2009, however Five only has rights to air half the season. It airs before Wizards of Waverly Place. Moisés Arias becomes a regular cast member. In "My Best-Friend's Boyfriend", Larry David was approached by the producers about being on the show when he attended a Hannah Montana taping with his two daughters, who were fans of the show. He agreed, and appeared in the episode with his daughters, playing himself as a "frustrated restaurant patron". David's daughters are "huge fans" of Hannah Montana. Heather Locklear was also convinced to guest star after attending with her kids. Camryn Manheim and Brooke Shields also have made guest appearances because their kids enjoy the show. John D'Aquino and Madison Pettis from Cory in the House make guest appearances as their characters in a special crossover episode. The Jonas Brothers also guest star in an episode. Dwayne "The Rock" Johnson appears in "Don't Stop 'Til You Get the Phone" as part of the Rock Block, in which he guest-starred in episodes of Hannah Montana and Cory in the House as a promotion for Disney's film The Game Plan. "I Want You to Want Me... to Go to Florida" features the ballad "Ready, Set, Don't Go" by Billy Ray Cyrus. It details his feelings concerning his daughter Miley's move to Los Angeles to star in Hannah Montana, while he stayed behind in Nashville. The episode also features the song "If Cupid Had a Heart", by Julie Griffin, and written by Gordon Pogoda. Mikayla (Selena Gomez), lip-syncs it in the episode. A soundtrack for the season featuring 10 songs sung by Miley Cyrus as Hannah Montana was released on June 26, 2007. 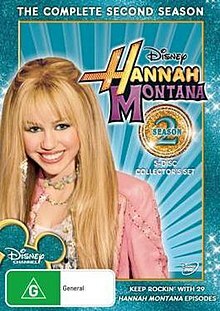 The second, Wish Gone Amiss Weekend DVD, which was released November 27, 2007, features the "When You Wish You Were the Star" episode and a Hannah Montana bonus "I Wish I May, I Wish I Might: A Guide to Making Wishes" hosted by Jason Earles. The Volume 4: One in a Million DVD which released January 29, 2008, includes four episodes of Hannah Montana. "Lilly's Mom Has Got It Goin' On", "Me and Mr. Jonas and Mr. Jonas and Mr. Jonas", "I Will Always Loathe You" and "That's What Friends Are For?" were included in the DVD. The DVD also features a That's So Raven episode "Run Raven Run", "Come Feud with Me" - the top 10 Disney Channel feuds, as well as the "One in a Million" and "True Friend" music videos. In Australia, following the release of the Complete First Season on DVD in November, Season 2: Part 1 and Season 2: Part 2 were released soon after. In part one, episodes 1-15 were included, while remaining episodes 16-29 were released in part 2. On the case, there are images from the episode "No Sugar, Sugar", but the episode was not released on the disc. A full season collection was released on November 25, 2009. Season 2 started with a week of 5 new episodes. The average ratings for the 5 new episodes were 3.7 million viewers. Season 2 had several special episodes and marathons. The first special was "Achy Jakey Heart", in which Miley revealed her secret to Jake Ryan (Cody Linley). The second special, "Me and Mr. Jonas and Mr. Jonas and Mr. Jonas", which guest starred the Jonas Brothers, was aired with the premiere of High School Musical 2. Dwayne "The Rock" Johnson appeared in "Don't Stop 'Til You Get the Phone" as part of the Rock Block, which seen him guest-star in episodes of Hannah Montana and Cory in the House as a promotion for Disney's film The Game Plan. "(We're So Sorry) Uncle Earl" aired in a week-long Disney Channel event "Sweet Niblets, We're Related?". In 3 episodes this season, Hannah Montana wins an award. Miley, Lilly, and Oliver start high school and Rico (who is also in high school after skipping a few grades) soon learns what he thinks is Miley's "big secret" and blackmails her with it by making her be his girlfriend. Lilly and Oliver later learn that the "secret" was just Miley's attachment to her teddy bear. At the end, Rico makes Miley feel bad so she tells him to kiss her on the cheek, but he turns his head and he kisses her on the lips. Meanwhile, Jackson's new friend Thor causes him major humiliation. Hannah song featured: "Make Some Noise"
Miley and Lilly start a fight after Lilly doesn't choose Miley first in a Flag-Football game in gym class. After Oliver gets annoyed with their behavior, he handcuffs them together right before Hannah's big award show. The girls have to work it out so Hannah can get ready. Robby gives Jackson the silent treatment when he gets tired of telling Jackson the same thing multiple times. Hannah song featured: "True Friend"
Lilly gets asked out to a dance, but Miley thinks she acts too much like "one of the guys" and gives her a big makeover, however the person who asks her out doesn't like "the new Lilly" so he stands Lilly up, prompting Miley and Lilly to take him to "The Teen Court" (A TV show involving teens on 'trial' for causing pain and humiliation to others). Jackson wins two tickets to the Lakers game and invites Thor, but Robby assumes that it will be a "father and son" outing, leaving Jackson trying to decide between the two without hurting the other's feelings. At the end of the episode Miley realizes it was wrong to change Lilly. Hannah song featured: "One in a Million"
When Miley receives a poor mid-term grade in Biology, Robby says she must ace her mid-term exam or it's no European tour for Hannah. Meanwhile, Jackson volunteers to take care of Thor's pet parrot, Snowball, but the talking bird creates problems for Jackson. Hannah song featured: "Nobody's Perfect"
Miley loses her voice after six encores at a Hannah concert, and learns that only surgery will fix the problem. Fearful of what a botched surgery could do to her career, Miley's late mom (Brooke Shields) appears in Miley's dreams to reassure her that nothing would change if Miley's surgery didn't go right. In the end, Robby has a separate dream involving Miley and her mother. Hannah songs featured: "I Got Nerve", "Life's What You Make It", "You and Me Together"
Note: When Miley is talking to her dad, Jackson is there, but in the next scene, he is gone, but is there again in the scene after that. Jackson may have moved out of the scene to get something. After Jackson's bathroom is destroyed, Robby makes Miley share hers with him, resulting in a war between Miley and Jackson. Robby grounds Miley and Jackson because of the fighting but they sneak out using Thor's truck. When the truck nearly falls off a cliff (that turns out to be no higher than 2 feet) they managed to escape, they are brought closer together. Meanwhile, Lilly and Oliver disguise themselves as Miley and Jackson to hide their absence from Robby. Lilly dates a boy, Lucas, and she realizes he is the greatest boyfriend she ever has, and Miley couldn't be happier for her, until she realizes that she's isn't happy with the two, and decided that she won't speak to her, till she caught Lucas kissing another girl and tells Lilly about it, but she thinks that Miley is jealous and snubbed her. Lilly then finds that Miley is right about Lucas and dumps him. Meanwhile, Rico sets an alarm system because someone or something stole his sunglasses. But Jackson gets annoyed by the alarm system. When Jake returns and re-kindles his relationship with Miley, she begins to feel guilty for keeping her "Hannah" secret from him; when Jackson gets fired, he and Oliver open a stand that sells "Cheese Jerky", which becomes more successful than Rico's. Rico then attempts to steal their recipe. When Jake creates a "normal person" disguise for his dates with Miley but still expects the star treatment he's been used to for so long, Miley considers breaking up with him, but fears he will get mad and reveal her secret. Meanwhile Jackson and Oliver's Cheese Jerky stand goes from success to failure when they can't earn a profit. Hannah song featured: "Bigger Than Us"
Hannah song featured: "Old Blue Jeans", "The Best of Both Worlds"
Billy Ray Cyrus song featured: "Ready, Set, Don't Go"
Hannah is invited to play in a celebrity tennis tournament, and invites Lola (Lilly) and Mike (Oliver) to attend, but realizes she shouldn't have brought either; Jackson tricks Rico into thinking he is "cursed" by paying a psychic to tell him he is an evil boy. Hannah songs featured: "Make Some Noise", "Life's What You Make It"
Hannah songs featured: "I Got Nerve", "One in a Million", "Bigger Than Us", "Life's What You Make It"
Note: In this episode Lilly and Oliver are unable to sing, but in the episodes I Am Hannah, Hear Me Croak, Get Down Study-Udy-Udy and Judge Me Tender, they are shown singing. Hannah song featured: "We Got the Party"
Note: The episode's title is based on the song "Don't Stop 'Til You Get Enough" by Michael Jackson. Miley and Lilly envision becoming sisters when they notice a spark of love between Miley's dad and Lilly's mom (Heather Locklear). The girls then try to get the two to go out on a date, but when it goes wrong, the two blame each other's parent so the two girls start fighting. Meanwhile Jackson and Rico switch places to see who could last in each other's shoes. Hannah song featured: "Life's What You Make It"
Mammaw Ruthie and Aunt Dolly return to celebrate Hannah's latest award but Dolly and Ruthie fight too much over Elvis Presley and ruin Hannah's award speech; Oliver agrees to help Rico film a commercial, but Rico can't shake his fear of being in front of a camera. After Jackson ruins Miley's 'Beary Bear', Miley plots revenge and destroys his special Joey Vitolo-signed baseball. When Jackson feels guilty and fixes Beary Bear, Miley goes to great lengths to replace Jackson's ball - luckily for Miley, Joey Vitolo's daughter is a Hannah fan. Meanwhile Robbie attempts to build a bookshelf. Hannah songs featured: "Rock Star", "Life's What You Make It"
Uncle Earl (David Koechner) arrives for a visit with the intention of becoming a rockstar; Barney Bittman (Gilbert Gottfried), a music critic renowned for his harsh criticism of popular performers, is planning on reviewing Hannah Montana. Hannah songs featured: "The Best of Both Worlds", "Rock Star", "Nobody's Perfect". While returning from Hannah's New Mexico tour, Miley nearly gets struck by lightning and dreams about how her parents first met at a diner and tries to make Robby and Miley's mom meet before she and Jackson totally disappear. Meanwhile, Lilly and Oliver get stuck to chairs, and attempt to get unstuck so they don't miss the Maroon 5 concert. Hannah song featured: "Old Blue Jeans"
Miley and Jackson forget that it was their father's 40th birthday, and argue over why he is annoyed at them. When they figure it out, they go to great lengths to make it up to him. Lilly and Oliver find a chip shaped like Darth Vader and try to sell it. Hannah is chosen to be inducted on a walk of fame, but Miley's upset when her prime location is suddenly downgraded to make room for a star puppet, "Pancake Buffalo", with a superstar sized attitude. Meanwhile Robbie takes over Jackson's shift when he can't get his car to go. Note: Pancake Buffalo is a parody of Lambchop and the "Hollywood Parade of Diamonds" is a parody of the Hollywood Walk of Fame. Hannah meets her idol, Isis, who constantly changes her image to keep things fresh. Hannah fears she will lose her audience if she doesn't follow suit, but her image makeover (Anti-Hannah) doesn't go as she imagined after a nightmare about performing for the Sunshine Girls. Meanwhile, Jackson is promised a raise by Rico, on the condition that he makes the sound of a dog when somebody say the word "dog." This makes Jackson be in a lot of trouble with an older boy, who injures him. Finally, Jackson tells Rico that if he was nicer, he would have lots of friends. Hannah songs featured: "One in a Million" and "True Friend"
Note: Isis is a parody of Madonna. The Sunshine Girls are a parody of Girl Scouts of America and have appeared on the That's So Raven episode, Rae of Sunshine. Miley starts dating a rich boy, Trey Harris. However, Trey's parents are rude to Miley because she is from Tennessee, so she tries to impress them by pretending to be rich and fancy. Meanwhile Robbie and Jackson attempt to clean out Jackson's room. Oliver and Joannie start dating, and Oliver wants Miley and Lilly to be friends with her. After a sleepover, Lilly and Joannie realize they have more in common than they thought, and Miley worries that Lilly won't be her best friend anymore. Meanwhile, Jackson gets a date with Rico's cousin. Note: This is one of only two episodes, the other being The Test of My Love, that do not show Miley Cyrus with the Hannah Montana wig. Miley's previous crush Johnny Collins (Corbin Bleu) wins a date with Hannah in a charity auction, but Hannah is forced into letting Rico join too. He wound up making the date miserable for both Johnny and Hannah. Meanwhile, Roxy's old enemy from school comes to visit, so Roxy asks Robby and Jackson to pretend to be her family. Hannah song featured: "If We Were a Movie"
Note: This episode's title refers to Corbin Bleu and High School Musical's song "We're All in This Together"
When Miley and Lilly suspect that Oliver has a crush on the school nurse (Rebecca Creskoff), they instead learn that Oliver has been diagnosed with diabetes, but is keeping it secret. Not knowing the whole truth about the disease, Miley overreacts to the news, and when the three attend Traci's "sweet sixteen", where a large assortment of sweets are being offered, she goes out of her way to keep Oliver from eating any of it. Meanwhile, Jackson has a new girlfriend (Katerina Graham) who is helping him earn good grades in school. When Robby finds out that she plans to break up with him, he does everything he can to save their relationship. Note: This episode was set to air in the U.S. on November 2, 2008 but Disney pulled the episode from the schedule after it was previewed by parents in an on-demand version; according to one of the parents, inaccuracies regarding the portrayal of diabetes were at the heart of their objections, adding that given Hannah Montana's huge influence over young viewers, correct information about the disease needed to be given. According to Mitchel Musso, the episode was re-written, re-shot, and was to be added to the third season of the show. The revised episode, called "Uptight (Oliver's Alright)" aired on Disney Channel on September 20, 2009. ^ a b c d e "`The Sopranos' No. 1 in Cable Ratings". Associated Press. May 3, 2007. Retrieved January 10, 2011. ^ Berman, Marc (May 8, 2007). "The Programming Insider". Mediaweek. Retrieved January 10, 2011. ^ "`Sopranos' Takes Top Cable Rankings Spot". Associated Press. May 25, 2007. Retrieved January 10, 2011. ^ a b Oldenburg, Ann (January 14, 2007). "Miley Cyrus fulfills her destiny". USA Today. p. D.1. Retrieved August 6, 2010. ^ a b "'Hannah Montana' Soars in the Ratings and Everywhere Else". Retrieved July 28, 2007. ^ "'Cory in the House' and Other Disney Shows Soar in Ratings". Buddytv.com. July 31, 2007. Retrieved August 6, 2010. ^ "`The Closer' No. 1 in Cable Nielsens". Associated Press. July 26, 2007. ^ "`The Closer' No. 1 in Cable Nielsens". Associated Press. August 2, 2007. Retrieved January 10, 2011. ^ "TNT's `Closer' takes top spot in Nielsen cable rankings for the week of July 30-Aug. 5". Associated Press. August 9, 2007. Retrieved January 10, 2011. ^ Andreeva, Nellie (August 20, 2007). "'Musical 2' upstages TV records". The Hollywood Reporter. 400: 1, 21. Archived from the original on October 18, 2007. Retrieved January 10, 2011. ^ "`MNF' Again No. 1 in Cable Ratings". Associated Press. September 28, 2007. Retrieved January 10, 2011. ^ "Cable's Most-Watched Shows, Oct. 15-21". Associated Press. October 24, 2007. Retrieved January 10, 2011. ^ "ESPN's `Monday Night Football' cable television's most-watched show for week of Nov. 5-11". Associated Press. November 14, 2007. Retrieved January 10, 2011. ^ "ESPN's `Monday Night Football' cable television's most-watched show for week of Dec. 3-9". Associated Press. December 12, 2007. ^ "`Monk' Tops Weekly Cable Ratings". Associated Press. January 17, 2008. ^ "Wrestling is cable television's most-watched show of the week". The Crescent-News. Associated Press. March 27, 2008. Archived from the original on January 10, 2011. Retrieved January 10, 2011. ^ a b c d Reynolds, Mike (August 11, 2008). "Ratings Go Higher For 'Hannah'". Multichannel News. 29 (31): 7. ISSN 0276-8593. Retrieved September 8, 2008. ^ Seidman, Robert (September 3, 2008). "Obama and CNN Best 'The Closer' and NASCAR on Cable". TV by the Numbers. Retrieved January 11, 2011. ^ "ESPN's `Monday Night Football' doubleheader tops cable rankings for week of Sept. 8-14". Associated Press. September 18, 2008. ^ Seidman, Robert (October 14, 2008). "Updated: NFL, Future President and Boston Red Sox lead Weekly Cable Viewing". TV by the Numbers. Retrieved January 11, 2011. ^ "Interview: Mitchel Musso talks about his new CD, touring this summer, Hannah Montana and more!". tommy2.net. Retrieved August 21, 2009. ^ "Uptight (Oliver's Alright)". Hannah Montana: Episode Info. Disney Channel Media Net. Retrieved September 17, 2009. ^ Castina. ""Hannah Montana" Diabetes Episode Pulled ("No Sugar, Sugar")". Retrieved November 9, 2008. "Hannah Montana Season 2 episodes". TV Guide. Retrieved November 27, 2009. "Hannah Montana: Episode Guide". MSN TV. Retrieved November 27, 2009.